This plan has 4 craftsman style posts on the front with a full covered veranda for a great country-style look. From the front foyer, there is a huge mud room/laundry room to the right, or enter into the mud room from the garage. To the left you enter the den through double french doors. The large walk-through pantry is also accessible from the mud room entrance. The kitchen has a huge island with an extra sink and eating bar that seats five. Enjoy the gas fireplace in the living room. Exit the dining room onto the rear deck. 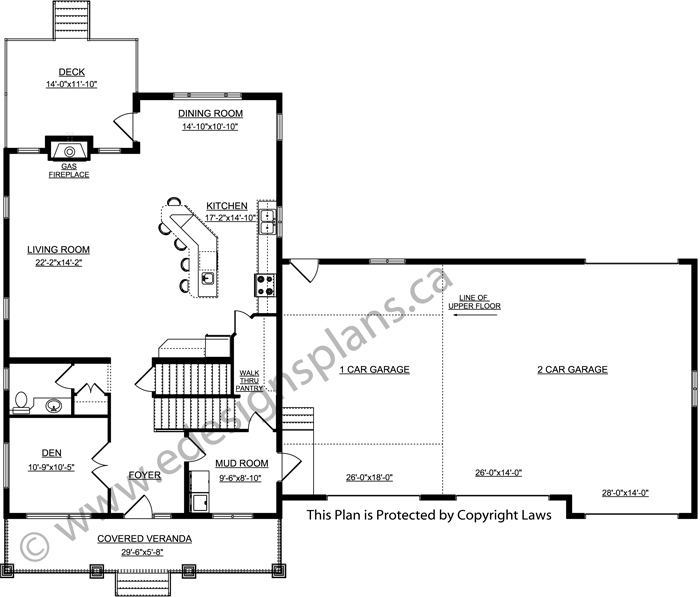 Up the stairs takes you to the bedroom area as well as a vaulted bonus room over the garage. A vast master bedroom is designed on the second floor with a 5-piece ensuite and walk-in closet. 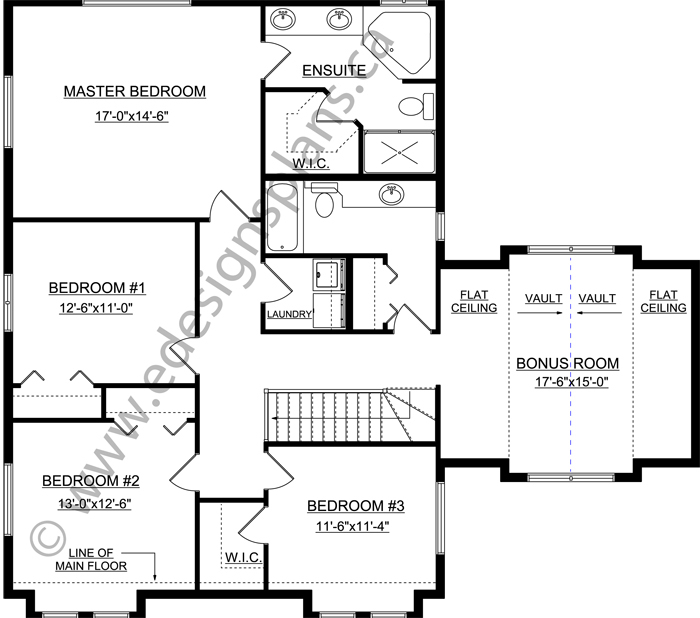 Three more bedrooms on this floor, two of which are extended out the front for additional space. The laundry room is conveniently located on the second floor. The garage has one drive-through bay convenient for the riding lawn mower, a small tractor, or ATV storage. All three garage doors on the front are 10'x8'. 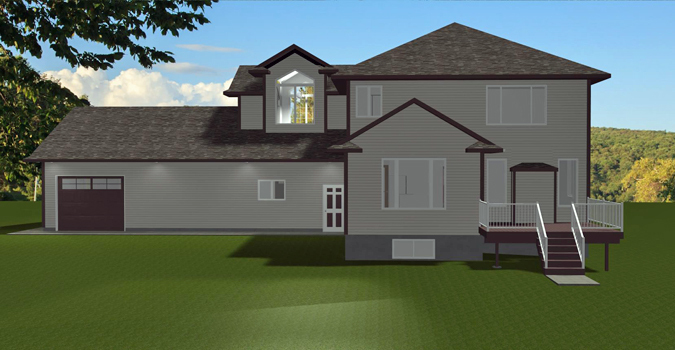 Have question about this house plan? When you have a question, you get to speak to the designer who drew the plans not a sales person. 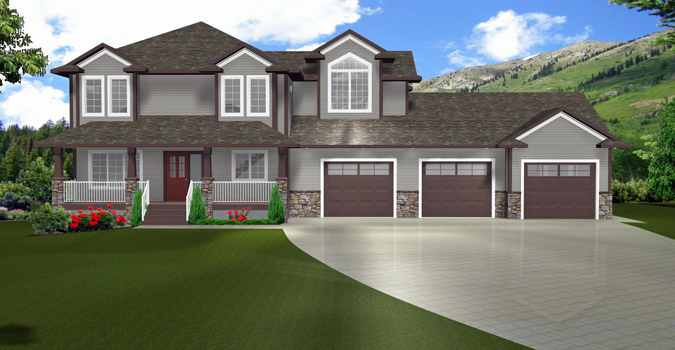 From our house plans, there are new homes built in Camrose, Drumheller, Brooks, Calgary, Dawson Creek, Cold Lake, Athabasca, Edmonton, Fort McMurray, Lethbridge, Lloydminster, Medicine Hat, Morinville, Grand Prairie, Hinton, Oyen, Provost, Westlock, Whitecourt, Wainwright, North Battleford, Estevan, Moose Jaw, Kindersley, Melfort, Prince Albert, Macklin, Rosetown, Swift Current, Unity, Saskatoon, Yorkton, Brandon, Dauphin, Flin Flon, Portaga La Prairie, Winnipeg, Halifax, Fredricton, Moncton, Yarmouth, St. Johns, Whitehorse, Yellowknife, or anywhere else in B.C., Alberta, Saskatchewan, Manitoba, Quebec, P.E.I., Nova Scotia, Newfoundland, New Brunswick, Northwest Territories, Nunavut and the Yukon. Including our Friends in the United States, E-Designs can help you get your new dream home started. See US Pricing in "Plan Packages"